Outside Plant OSP Broadband cables are designed to provide an extension of the LAN beyond the premises or in situations where the NEC code requires an OSP-rated cable when it is in contact with earth – whether in a conduit or not. The cable consists of four (4) balanced twisted pairs surrounded by gel which, not only prevents water ingress and is easy to clean, but will not drip or flow, even in cell tower applications. The core is jacketed with a sunlight and abrasion resistant black polyethylene outer jacket. Shielded designs feature dry water block between the shield and the core jacket to prevent water ingress. They providing exceptional protection as well as resistance to EMI/RFI. All shielded designs are suitable for buried applications. The outside jacket is OSP-grade black polyethylene for superior sunlight and abrasion resistance. 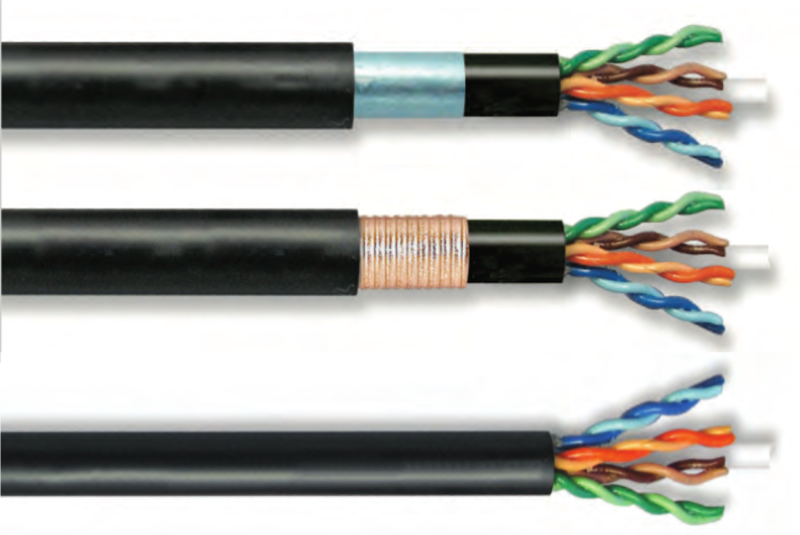 These cables are available in Category 5e, 6 and 6A cable designs.